Hi friends, Here are all version of Framaroot App with simple and easy installation guide. You get Faramaroot App with how to use guide. This is a great app to root Android phone without PC or Laptop. What is a Framaroot App ? Framaroot app is an app that allows to you root your Android device which is running from Android 2.3 to 4.2 in a single click. It is a powerful APK for all Android devices and you can use this Framaroot apk without PC or Laptop. 1. One Click Root: Framaroot app is an oldest One click app, that allow you to gain root access on your Android device which is running on Android 2.3 to 4.2 only. By using this app you can install SuperUser and SuperSU on your android device. You can get root access by just one click on Boromir or Gandalf or Aragorn, which option you get. 2. Multiple Exploits: Framaroot app comes with Multiple Exploits including Frodo, Aragorn, Gandalf, Boromir, Legolas, Pippin, Faramir, Gollum and Barahir. These exploits allows you to gain root access on your device. 3. Quick unroot: Framaroot supports one click unroot, including clean all flashing, saver user data flashing and clean all and lock flashing. If you want unroot then open the app and go to the setting, then click on full Unroot that’s all. Step 1: Download Framaroot app from the download table on your phone. 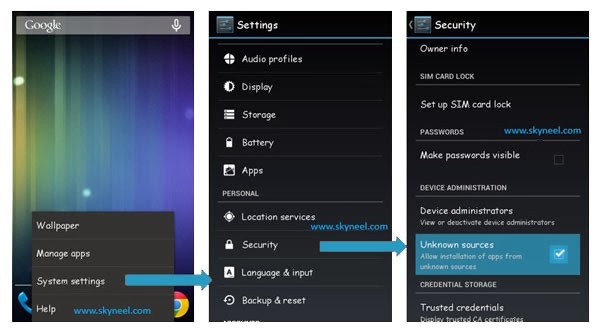 Now enable unknown sources app on your phone by go to setting, then tap on security tab and scroll down and tick on the unknown sources box (After install Framaroot apk, you must be un-tick this unknown sources box, doesn’t forget it). Step 2: Now installing Framaroot Apk, so tap on Framaroot apk file. You will get a popup tab then select by tap on the verify and install option. After then tap on Just once tab. Now tap on Install. Step 3: After complete installation of Framaroot apk, you will get two option first one “Done” and second “Open“. Now tap on the open and run Framaroot App. Step 4: Now Select “Install Super Su”. After then you will see one of these options “Boromir or Gandalf or Aragorn” and tap on which option you get. Now reboot your phone and enjoy rooted phone. I hope you get your desirable Framaroot app version. You can easily root your device. Thanks to Framaroot Developer.